Animating a car zipping across the stage is one thing, but to achieve more natural movements, you'll need to use the Animate Bone Tool. The Bone Tool allows you to create skeletal joint-type connections between shapes. 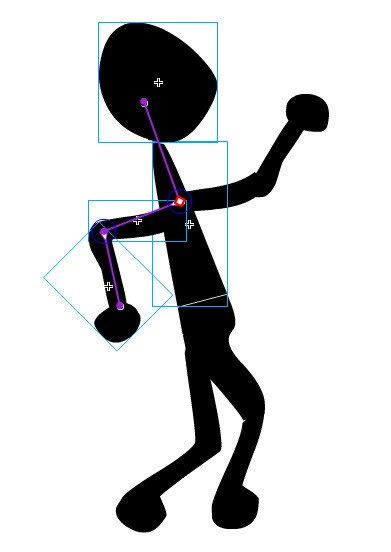 In this example, a dancing animation will be created. As you can see there are separate shapes for the head, torso, arms, hips and legs. Using the Bone Tool [ ], shapes are connected from one to another. Here I've dragged from the torso to the head. To connect the arms,go to the original starting point on the torso and drag to one of the upper arm shapes. Release the mouse, then click again on that same upper arm shape and drag to the elbow. For the other arm, go back to the torso start point and repeat. Then connect the torso to the hips, and the hips to each leg. 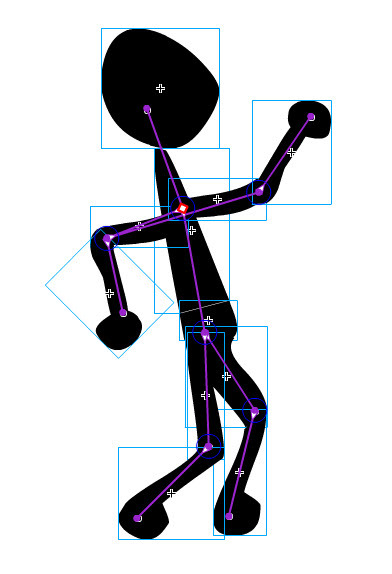 Once the skeleton is built, the Selection Tool can be used to move the various shapes to different positions. 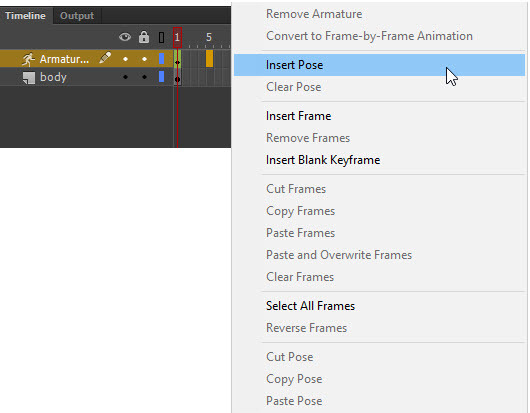 First, go to the Timeline and click on a future frame, then right-click and choose Insert Pose. Move the shapes around to change the pose on the stage. 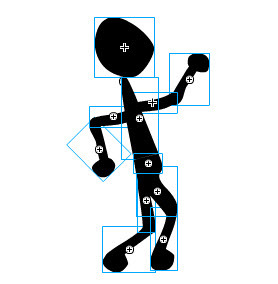 Continue inserting poses on the Timeline at future frames, and using the Selection Tool to change the poses on the stage.